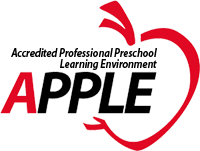 Apple Accredited and Gold Seal Approved, Apollo Preschool is a Child Care Center served by a full service child development staff for children aged 6 weeks to 12 years. Founded in 1979, Apollo Preschool offers Free VPK, Infant Care, After School, and Summer Programs. Apollo Preschool provides a nurturing environment that fosters the enrichment and creativity of children. Our programs emphasize the social, cognitive, moral, and physical development of each child to prepare them for a lifetime of learning and knowledge building. Open Monday through Friday from 6:30AM to 6:00PM. Department of Children and Families License #C18BR0091.